Fall is almost here, and that means that a whole host of great fall activites are coming to Hendricks County. My family visited our first this past weekend when we explored the Prairie Maze at McCloud Nature Park, 8518 N. Hughes Road, North Salem. 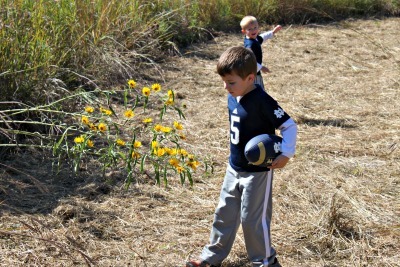 We had a great time getting out in nature and exploring the local wildlife as we maneuvered our way around the maze. If you haven&apos;t made it out to the Prairie Maze before, I highly recommend that you do. But before you make the trip, be sure to take a look at my seven tips for navigating the maze, so everyone in your family is sure to have a great time! McCloud Nature Park and the Prairie Maze are open from dawn to dusk. The maze is open through Oct. 31, and access to both the maze and the park is absolutely free! This year&apos;s maze is in the shape of an owl swooping down to grab its prey. 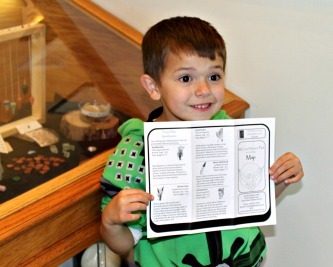 Be sure to pick up a maze map at the Nature Center. If the Nature Center isn&apos;t open, you can find maps just outside the door. The park staff asks that you help conserve resources by returning your map when you&apos;ve finished the maze. Walking through the maze means making a 3/4-mile hike -- and that&apos;s if you follow the correct path. We let the 5-year-old hold the map, which meant our hike was a little bit longer. While the maze is open to all ages, keep in mind that the path is not stroller-friendly. If you&apos;re bringing very young children, be prepared to carry them if they get tired. My 3-year-old walked the whole way, but he did request to be carried a few times. Younger children may have more fun exploring other areas of the park. Dress in layers. The air has been cool lately, but hiking the maze can cause you to work up a sweat, particularly on a sunny day. And as most Hoosiers know, Indiana weather can change quickly! Bring your camera! 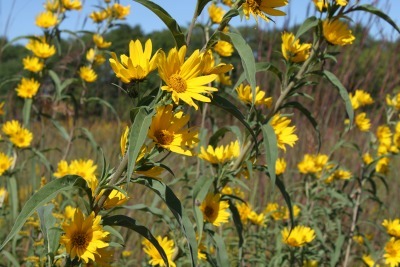 The prairie is full of gorgeous Indiana wildlife, including some of the most amazing flowers I&apos;ve ever seen. More information about the prairie wildlife can be found on your maze map. Consider making the Prairie Maze part of a full day at the park. McCloud Nature Park offers great hiking trails, fishing, a Nature Center, a picnic area, and 232 acres of land to explore! Pack a lunch and spend a day away from it all, enjoying the beautiful Indiana autumn. To find out more about the Prairie Maze and to plan your visit to McCloud Nature Park, check out the Hendricks County Parks website.